In the morning, you will be picked up by our guide and driver at the lobby of your hotel in the downtown area. Today's private sightseeing starts from the remarkable and world's largest square - Tiananmen Square, located at the center of Beijing City. 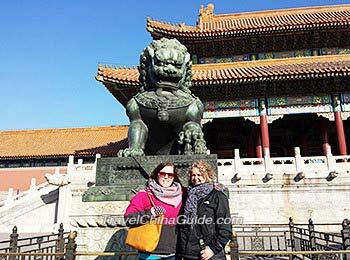 Immediately north is the well-preserved imperial palace complex, the Forbidden City. You enter that ancient place, full of regal history, passing over the Golden Water Bridge. You make your own arrangements for lunch. Our guide will give you advice. In the afternoon, your tour will continue visiting one of the beautiful royal landscaped gardens - Jingshan Park. Standing at the top of the hill inside this park, you can see the panorama of the Forbidden City. Then, you will be escorted to visit the Temple of Heaven, which was initially built for the emperors of the Ming and Qing Dynasties to worship the god of heaven for peace and good harvest. You will be picked up early in the morning at your hotel by our guide and driver. After a drive of about 1.5 hours, you reach the Badaling Great Wall, one of the most famous sections of the Great Wall. Hiking on the wall for 1-2 hours will allow you to experience the steepness of the wall and appreciate the charming scenery. Then, we drive towards another famous section of the Great Wall - Mutianyu. On the way to Mutianyu, we will stop at Juyongguan Great Wall and leave you some free time for photo-taking. Here, you make your own arrangements for lunch. Since the restaurants near the site are shopping-tourist restaurants with low-quality food, we kindly suggest you have a hearty breakfast at your hotel, or prepare some snacks for lunch. 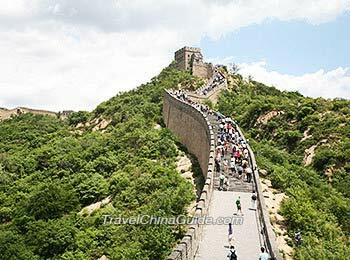 In the afternoon, we continue on and visit the Mutianyu Great Wall (a round-way cable car trip is included) and hike for a while to further explore the world-famous Great Wall of China. Our guide and driver will pick you up from your hotel in the morning and transport you to the Summer Palace. It is the largest and most well-preserved of the royal gardens. Nowadays, it is famous for its amazing landscape and the grand architecture. Next stop is the Lama Temple. As the national centre of Lama Administration in the Qing Dynasty, it has been perfectly preserved. Visiting it, you will get to know to some extent the Lama culture. Your trip draws to an end after you have a Hutong tour. People say that the real culture of Beijing is the culture of the Hutong and Courtyards. They attract more tourists from home and abroad than the high-rise buildings and large mansions. After the Hutong tour, you will fully understand this sentiment. After the private trip is completed, we will transfer you back to your hotel. An american flying from Dallas to Beijing then to Hong kong. And would this qualify for the 144 hour visa free transit? Does the plane itinerary have to be all on the same record or can you have one flight from dallas to Beijing then another flight from Beijing to Hong Kong within 3 days? As I know, it doesn't matter if you book different tickets with different carriers. You can also apply for the 144-hour visa free transit at Beijing airport as long as you have the flight ticket to Hong Kong with confirmed seat and date. As a US citizen w/a US passport, can I utilize the 72hr China Visa if I'm traveling from Korea to Beijing (18-20 Apr) then onward to Taiwan on 20 Apr? From my experience, I think you can apply for the 72-hour visa-free transit at the Beijing airport. And you need to show your valid passport, onward flight ticket with confirmed date and seat and the third country's visa if needed to the staff of transfer visa-free counter. US Citizen, flying from Los Angels to Manila for 5 days then to Beijing for 4 days. Will I be fine with the 144-hour visa-free transit? 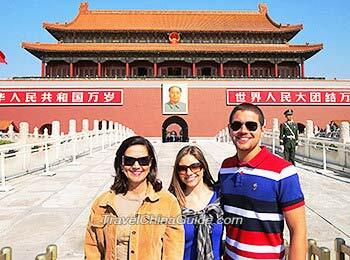 You are not eligible for the 144-hour visa free transit if your itinerary is flying to Beijing from Los Angeles through Manlia. If your route is from Los Angeles to Manlia and have a layover at Beijing airport with no more than 144 hours, you may apply for the 144-hour visa free transit. can the 3-day tour start at the airport and end at the railroad station? Yes. You can start at the airport and end at the railway station if you join this private 3-day tour with us. And there will be some extra mileage charges. If you are interested in our tour, please feel free to contact us for more details, Thanks for attention. Can we have 4 suitcases in the car the first and third day? We are 5 persons. Yes, it is possible. The size and type of car we arrange depends on the number of our guests and the amount of luggage. You can ask for it when you book a tour with your travel consultant. If you need any help, please feel free to contact us. Thanks for your attention.